Image © [caption id="" align="alignleft" width="182" caption="© lemonflea on DeviantArt"] [/caption] The ACTA legislation has been signed by the EU and its Member States since August 2011, though has only been widely known recently due to the protest against SOPA and PIPA. While the European Commission has gone to great lengths to distance itself from these bills, even releasing a '10 Myths about ACTA' publication, the ACTA legislation appears to be the cause for the SOPA and PIPA bills. The US of A is a Member State of the EU and thus, by signing, should enforce ACTA as they see fit - according to Article 2.1 of the final text. The reason I feel ACTA is a back door for legislation is due to the term 'Policy Laundering'. By having global legislation which requires the protection of Intellectual Property (IP), all who signed ACTA are now bound to enforce it, even if the legislation goes against what citizens want. What is worrisome is each party is allowed to enforce ACTA differently and the expectations of the legislation. With each party implementing different legislation, there will be no standard to criminal charges for those counterfeiting IP. Article 23 expects criminal procedures and penalties for the commercial sale of IP yet doesn't define commercial sale, making it possible for large scale counterfeit organisations to not only be penalised differently in different places, such as varying fines before imprisonment or even straight to imprisonment. In addition there is the possibility of a minor being fined or imprisoned whether due to piracy or abetting piracy, even if it is unknowingly done. The other problem with the varying implementation of ACTA is it may be encouraging the movement of large scale counterfeit organisations to countries not signed up to ACTA to avoid such charges. Which in turn, may possibly call for legislation like SOPA, to deal with this by cutting funding to internet companies linked to websites with known counterfeit IP and possibly leading to IP monopolies by large corporations as they will have the funds to avoid links to websites with counterfeited content, something small and start up companies cannot afford. The monopolising of research not only runs the risk of causing high prices for products such as medical drugs, but also on education - possibly slowing down progress as people could struggle to debate concepts or research it themselves if it has been protected. If taken to the extreme it could possibly mean an inability to communicate and share ideas with others over the internet and the shutting down of social media websites, if the ideas shared are the IP of large companies. The ACTA legislation has been signed by the EU and its Member States since August 2011, though has only been widely known recently due to the protest against SOPA and PIPA. While the European Commission has gone to great lengths to distance itself from these bills, even releasing a ’10 Myths about ACTA’ publication, the ACTA legislation appears to be the cause for the SOPA and PIPA bills. The US of A is a Member State of the EU and thus, by signing, should enforce ACTA as they see fit – according to Article 2.1 of the final text. The reason I feel ACTA is a back door for legislation is due to the term ‘Policy Laundering’. By having global legislation which requires the protection of Intellectual Property (IP), all who signed ACTA are now bound to enforce it, even if the legislation goes against what citizens want. What is worrisome is each party is allowed to enforce ACTA differently and the expectations of the legislation. With each party implementing different legislation, there will be no standard to criminal charges for those counterfeiting IP. Article 23 expects criminal procedures and penalties for the commercial sale of IP yet doesn’t define commercial sale, making it possible for large scale counterfeit organisations to not only be penalised differently in different places, such as varying fines before imprisonment or even straight to imprisonment. In addition there is the possibility of a minor being fined or imprisoned whether due to piracy or abetting piracy, even if it is unknowingly done. The other problem with the varying implementation of ACTA is it may be encouraging the movement of large scale counterfeit organisations to countries not signed up to ACTA to avoid such charges. Which in turn, may possibly call for legislation like SOPA, to deal with this by cutting funding to internet companies linked to websites with known counterfeit IP and possibly leading to IP monopolies by large corporations as they will have the funds to avoid links to websites with counterfeited content, something small and start up companies cannot afford. The monopolising of research not only runs the risk of causing high prices for products such as medical drugs, but also on education – possibly slowing down progress as people could struggle to debate concepts or research it themselves if it has been protected. If taken to the extreme it could possibly mean an inability to communicate and share ideas with others over the internet and the shutting down of social media websites, if the ideas shared are the IP of large companies. Well, I think it's a good a thing – people need to pay for the goods! 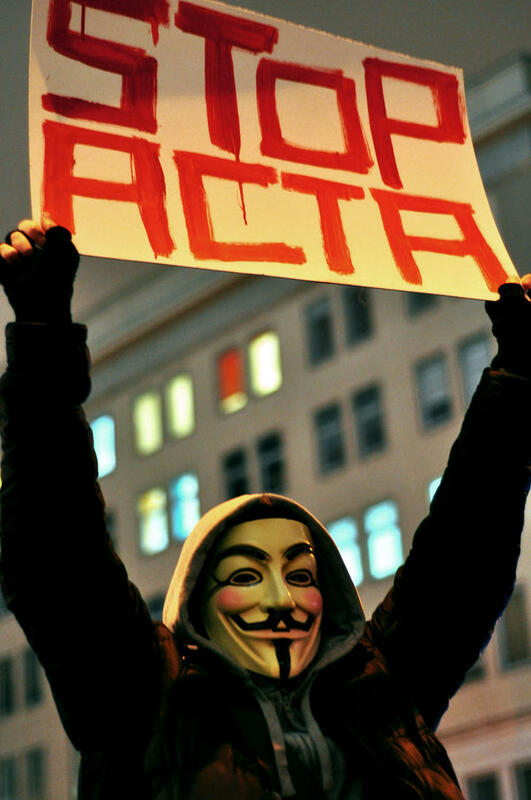 I don't think you understand what ACTA is about; ACTA is about protecting Intellectual Property (IP). Yes copyrighted work is IP, but it is not all that is considered IP – research and designs are also IP. I am typically to running a blog and i actually recognize your content. The article has actually peaks my interest. I’m going to bookmark your web site and maintain checking for brand new information. Its good to know you recognise the content of my blog and you find it interesting.